Taking into consideration that the definition of war is “armed conflict between hostile parties, nations or countries” it is fair to include Breakfast on Pluto or any other movie dealing either with The Troubles, the IRA, Terrorism and similar things in a blog dedicated to war movies. A while back I reviewed Neil Jordan’s Michael Collins, and an other outstanding movie on the Irish Civil war and war of Independence, The Wind that Shakes the Barley (also starring the stunning Cillian Murphy), and I did also review Bloody Sunday. Each of these movies tells about another era in this long-lasting conflict between Ireland and the UK. Breakfast on Pluto is not only a highly original variation on the theme of The Troubles, Northern Ireland and the IRA but also one actors tour de force. Patrick Kitten Braiden (Cillian Murphy) is not exactly like other boys. Left as a baby by his single mother on the doorsteps of a church, he is given to a foster family who can’t handle him. Already the very young Patrick is not interested in boy’s things or clothes. He likes to dress like a girl, uses make-up and lives in a fantasy world where he is either a famous film star or meets his mother who lives a glamorous life in London. Small-minded Irish small town life of the 70s isn’t an ideal place for a young man with gender issues. Despite being an outsider, his charming likable nature provides him with friends, still it is obvious he doesn’t want to stay in Ireland. He wants to go to London and find his mother. Some of the group of friends he hangs out with are politically active and join the IRA. Kitten isn’t exactly interested in politics, at least not conscioulsy, but he wants change. He wants to express himself freely and be accepted the way he is. After a huge fight with his foster family he leaves the small town and travels around. He is picked up by some Irish Glitter Rock Band and tours with them in their bus through Northern Ireland. But wherever he goes, people seem to be involved with the IRA and through his naivety he gets himself into a lot of trouble and finally departs to London. He lives under the illusion that once in London he will magically bump into his mother. Regarding the IRA, things haven’t changed in London, Kitten still seems to be always somehow at the heart of things. The big difference however is that this time, he doesn’t see the angry hostile presence of British soldiers but the mayhem created by a terrorist attack. Being the only Irish present in the club that is blown up, he is arrested. The adventures of cross-dressing Kitten, his tribulations and struggles to find his mother are told in a charming, funny and quirky way. Breakfast on Pluto manages to tell the story of The Troubles seen from a completely different angle. Cillian Murphy as the unworldly, gentle Kitten is really astonishing. To a certain extent Kitten reminded me of Birdy. Like Birdy the movie Breakfast on Pluto is also a really touching tale of friendship and a call for tolerance. Maybe not your average war movie, but well worth watching. I really enjoyed it. The music is also very well chosen. I owe thanks to Novroz from Polychrome Interest who introduced me to this movie. 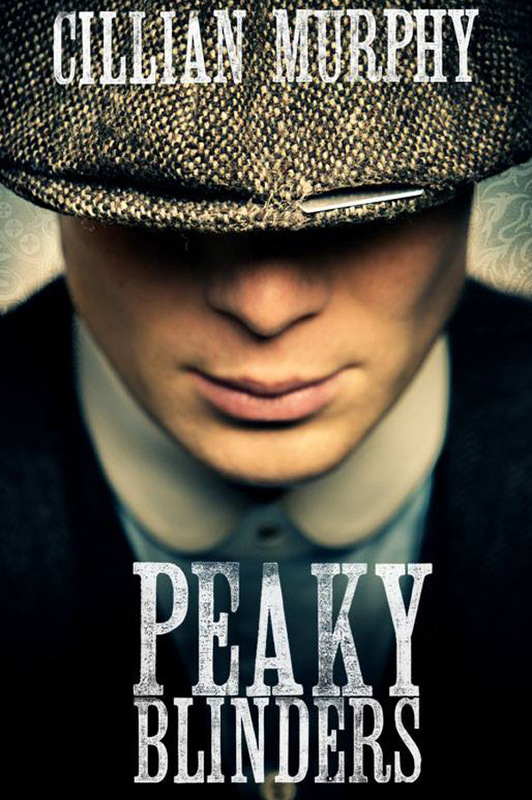 If you are interested in Cillian Murphy’s other movies, go visit her website. She is a true “Cillianiac”. I discovered this short Irish movie thanks to Novroz. I hadn’t heard of it. It is well done but admittedly very short. There doesn’t seem to be any intention of making a full length movie out of The Silent City. I have a feeling they quote quite a few movies. Starship Troopers and Behind Enemy Lines? The back of the uniforms look like backbones. I was also reminded of District 9. Definitely a Sci-Fi thing ging on here. Be it as it may, watch it, it’s worth it. 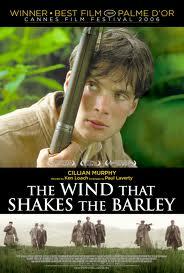 The Wind that Shakes the Barley opens on a group of young men joyfully playing a game of hurling. After the game has ended we watch them return home to their modest houses. Some are still standing together smoking and talking, when all of a sudden a group of British soldiers approaches out of nowhere confronting them with the fact that they did break the law. Meetings are strictly forbidden and even a game of hurling is considered to be an assemly and thus a possible act of rebellion. The scene heats up immediately when the young men answer in Gaelic upon being asked their names. The episode ends in a blood bath, one of the young men being beaten to a pulp and dead. This is shocking. One can hardly believe one’s eyes since this is no invention. The British subjugated the Irish fiercely and anything resembling rebellion from their side ended in severe punishment. Ken Loach´s movie The Wind that Skakes the Barley (the title is taken from an Irish Ballad) embraces both moments in Irish history, first The Irish War of Independence and then The Irish Civil War. At the core of the story that is set in county Cork are the two O´Donovan brothers, Damien (Cillian Murphy) and Teddy (Pádraic Delaney). At the onset of the war Damien is about to leave his native Ireland for London where a position as a doctor at a hospital is waiting for him. Seeing the brutality and the cruelty his people face and knowing that his brother will be leading a guerilla party, he stays to join them. At that time the British government sent the so-called “Black and Tans” to brutally reinforce their power. The old IRA started to strike back. After long months of heavy fighting they were asked to sign a treaty which would guarantee the Irish their own government and established the Irish Free State. However six Northern counties would stay within the United Kingdom as Northern Ireland. This is the moment when the Civil War erupts and Pro Free State (headed by Michael Collins) troops fought the Anti-treaty forces. In the movie the tragedy unfolds as the brothers go different ways. Teddy accepts and supports the Free State while Damien wants to fight until all of Ireland is free. He believes that they have fought in vain if they give up now. It is unbelievable but the Civil War cost finally more lives than the War of Independence. The Wind that Shakes the Barley was as hard to watch and as depressing as L´armée des ombres. The methods applied resemble those applied by the French Resistance. They wouldn’t even shy away from killing their own in the event of betrayal. We also see people being shot and people being tortured. This movie is also hard to watch since it reveals a really ugly aspect of the British Empire. If you are British this will be hard to accept, if you like the British it will be equally hard and if you are Irish this will truly infuriate you. One can simply not understand why the Empire had to make the already impoverished, famished and sick Irish suffer so much. I read that this part of their history is not really taught in English schools. I think many English people would be shocked and astonished when they see this and might understand a lot better what was ultimately behind the Troubles. There is no doubt that this movie deserved the Palme d´ Or it won in 2006. Even though I am sure the movie could not cover all the aspects and the whole complexity of the Wars, it raises the awareness. It´s simply stated a brilliant movie. But it is not entertaining for one second. Harsh but recommended viewing really. While waiting for my upcoming post on this movie on the Irish Civil War you may watch a brief interview with Cillian Murphy.